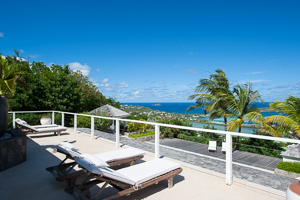 Stroll amongst the bougainvillea and gardenias around the 5 bedroom Villa UJV 153, or Tatiana, in Vitet, St Barts. Settle in for the day poolside on the sunny terrace where a Japanese inspired wooden infinity deck is designed for soothing contemplation of nature's beauty. Classic Richard Schultz designed chaises lounges and an oversized, comfy bamboo and wicker lounger tempt you to soak up the sun and the expansive views of the turquoise Caribbean. For a shady retreat, head to the poolside gazebo for a breezy lunch. The kitchen is designed in tropical woods, stainless steel, polished concrete, and glass. It is contemporary and fully-equipped, with the most modern top-of-the-line appliances. The indoor living area, overlooking the pool, features oversized white linen couches, Artemide reading lamps, and a full entertainment center with music matching the serene mood of the villa. All the bedrooms have king size beds dressed with Italian linens and cashmere blankets. Thick white European drapes provide privacy and atmosphere. This unique villa is inspired by the principals of the Zen garden: simplicity of line and form with minimal and contemporary furnishings, allowing the beauty and tranquility of respected materials to inform your experience. The villa overlooks Grand Cul de Sac and the ocean beyond, and is just minutes from fine dining at four intimate beachfront resort hotels - Le Sereno, the Hotel Christopher, Hotel Guanahani, and Le Toiny. Please note: this villa is available at the list price over Thanksgiving; there are no breakdown rates.